Worked this one with Ken Harker (WM5R). A better outcome than 1994 and 1995, but could have done better with more ops. Despite the higher score we still ended up only in 3rd place in STX. We did manage a Clean Sweep though. Final Score = 182964 points. operating (10M Contest, NAQP, WPX, etc). 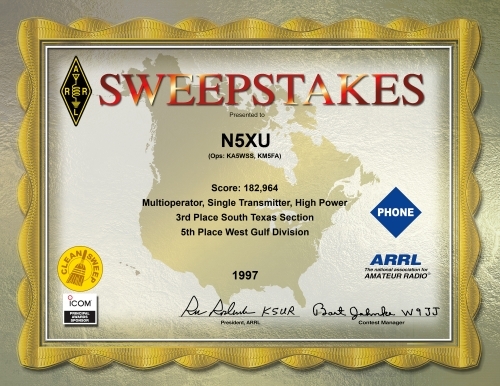 This was the first phone contest using the club’s new callsign, N5XU. didn’t slow us down too much though. 15 we moved to 20 to work one of the KL7’s posted on the PacketCluster. stations I hoped to get was W5WMU in LA, since I knew they were on. he didn’t need STX for a mult. pick up the new mult. a lot so I hope this turns into lots of logs submitted as well.